This past year has given us fewer new restaurants, but those that have opened have been a tasty selection. In the Twin Cities, we’re eating more casually with French and Southeast Asian flare. The wine lists are filled with funky selections from small vineyards that keep the prices affordable. Menus ply us with bold and sultry, mellow flavors in equal measure. These are the new favorites sure to become beloved restaurant standbys for years to come. 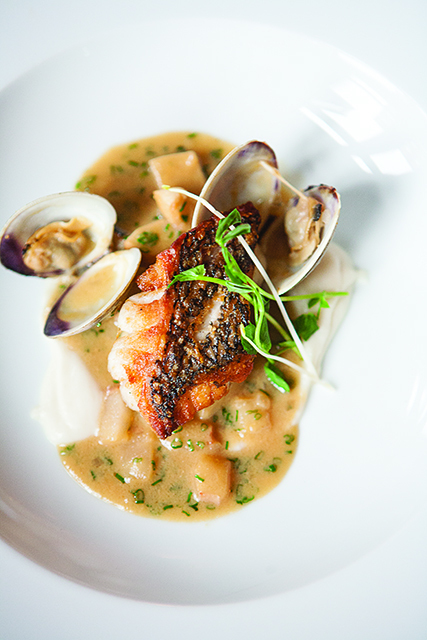 Jamie Malone’s restaurant is both a breath of fresh air on the national dining scene and a relaxed neighborhood bistro. It’s easy to dine here several times a week with beguiling details in the blush-accented decor and dishes like the ethereal pike quenelle. Chef and owner Daniel del Prado reached into his past and created a menu filled with dishes close to his heart: fresh pastas, plenty of perfectly prepared seafood, and empanadas. The menu is Italian and Argentinian with a little American touch. Don’t miss the boundary-defying cocktails from Marco Zappia. This restaurant is a flavor vacation through Southeast Asia from Christina Nguyen and Birk Grudem. I plan to move into a patio seat this summer and never leave. Powerful punches of fresh herbs, fish sauce, and spice result in revelatory flavors arriving in a myriad of dishes, all priced at astoundingly affordable prices. Matty O’Reilly and JD Fratzke have created a neighborhood hotspot in a sleepy little part of Highland Park. Half the little restaurant is always saved for walk-ins, meaning the bar is usually filled with locals. The brief menu consists of French-influenced comfort food with the soulful sort of cooking expected of Fratzke. The wine list is fun to peruse at purse-friendly prices, and there are several ultimately refreshing cocktails. This Northeast restaurant from chef/owner Remy Pettus is stunning, with a million art deco details to examine before even cracking a menu. There’s the huge chandelier and the mural of the Hennepin bridge, but don’t get so distracted that you don’t order piles of food. The menu changes with the locally sourced ingredients availability, but a wise order includes a salad, small order of pasta, and an entree with cocktails or a dazzling glass of wine. This restaurant is the playground of the chef/owners Grisha Hammes and Cameron Cecchini. From the serving vessels (or plates—I guess normal people just say “plates”) to the way the food is served, this revolving tasting menu is just downright fun. It’s also one of the most affordable chef’s menu experiences in the Twin Cities at $50. Michelle Gayer’s first full cafe is gorgeous. It’s the sort of place you want to curl up with a perfect cappuccino and carb load on croissants, tartines, and basically anything that comes out of this little kitchen. It’s only open until 4 p.m., but the bright, airy spot is worth getting up early for. While the current dining trend seems to be going for a much more casual experience, this restaurant is a capital-E Experience. It’s almost like getting to participate in a delicious art exhibit. Minneapolis’s only kaiseki restaurant is a meditative study in fine dining. Tim McKee has long been synonymous with fine dining, but his new restaurant with chef de cuisine Shane Oporto is completely appropriate to eat in well-worn jeans and a t-shirt. A starter of sunnies tastes like a memory of childhood summers at the cabin, and the pozole verde will linger in your future food dreams. We’re sneaking this one in under the wire, because, technically, Gavin Kaysen’s French bistro in Wayzata has been open just over a year, but there is no way to talk about food in the past year without mentioning this beauty, as well as the service and experience behind this elegantly comfortable destination. From the breathtakingly buttery breakfast pastries to the towers of seafood to the flawless attention to detail, it’s a jewel in local dining.